Let’s go back in time again Sydney Siders! In my last post I was encouraging you all to check out the 2000 year old terracotta army of China’s Entombed Warriors which is currently in town. But this time we’re going even further back – to prehistoric times! 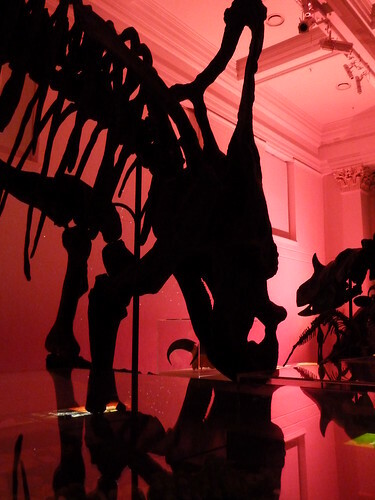 Every Tuesday from now through until the 19 April sees the Australian Museum transformed as the relics of hundreds of billions of years ago are blended with music, images, sound, entertainment and knowledge to create a very special event: Jurassic Lounge. To give you some background, basically each Tuesday the museum hosts an after-hour sessions featuring art, live music and new ideas. Last week was opening night for the project and all the people I spoke to who attended both it and the second week were in agreement that it was a resounding success. Each week there are musicians performing, DJ’s, VJ’s (which is like a DJ but instead of music they mix video to create dynamic installations that respond to music, crowd, mood etc), talks, food, artists, some special animal visitors and more. So you probably get the idea that there is plenty to do! This Tuesday I had a chance to catch soul musician Ray Mann performing in a room filled with skeletons, local DJ/VJ team EightFilters lead a room on a musical and visual journey, talks from a sexologist on aphrodisiacs (which included free chocolate being given away!) and even a life size dinosaur wandering the floors! Before I forget, anyone attending should also definitely check out the amazing silent disco. Don’t know what a silent disco is? Basically it’s like a normal disco but everyone involved wears headphones to hear the music, making it a lot of fun to participate in but even more surreal to watch when you can’t hear the music but just see the crowds reactions to each new song – Sweet Child o’ Mine by Guns N’ Roses was certainly one of the more distinctive songs to watch the crowd rock out to! There’s also a bunch for Jurassic Lounge happening online. Obviously you can check out their website and follow their blog or what shows and special events will be there each week, but they’re also running a giveaway on their Facebook page for best picture of the event, as well as weekly treasure hunts around the museum through their Twitter account! You can also see some of the pictures from each week as well as behind the scenes shots on their Flickr stream. As I mentioned above, one of the other things I got to take part in was the treasure hunt. The Jurassic Lounge Twitter account posts a picture of a close up of an exhibit in the museum – and the first one to find it and tweet its name wins! I wasn’t fast enough this week but there’s always next. In fact, it’s worth going a couple of times at least if only for the great atmosphere, always interesting performances and the special treat of being in the museum after dark! Have you been yet, or intend to go? Even if you haven’t or can’t make it why not just let me know what your favourite dinosaur is in the comments below! Sweet Child o’ Mine by Guns N’ Roses always get’s ‘em yelling! Great post. Hi! I am a yr 10 student from Northmanhurst Boys High School. I am looking for 1 wk work experience in August 2011. I am interest in History. I hope that you might be able to help me with a placement. thank you for your time.